The aces in the tarot are all indicative of new beginnings. When you draw any of them, it means that you are at a point in your life where a new cycle is beginning - you are about to start afresh. Because the suit of pentacles is primarily concerned with all things material (not just financial, but also with the sensual), this reset could manifest itself as a new career, the undertaking of a new venture, or the start of putting more care into your health. Wherever this beginning takes place, the Ace of Pentacles assures that what is to come will bring great abundance and opportunity. Watering this seed has the potential to be very rewarding - for anything that is grown on this energy is meant to be stable, secure and give a good yield. To see the Ace of Pentacles indicates a seed being planted in the material world, in your feelings of security and stability. Like a seed, this opportunity must also be nurtured, and sometimes invested in with energy, time or funds. Watering this seed has the potential to be very rewarding - for anything that is grown on this energy is meant to be stable, secure and give a good yield. Prosperity is coming your way. One also has to make sure that they are psychologically prepared for the opportunities that are appearing. To be able to harvest the gift of the pentacles, we need to be filled with the calm that stability brings - this is a kind of spiritual prosperity, if you will. This kind of mindset can mean we become open to trying new things and not sticking to the old, washed out routine. 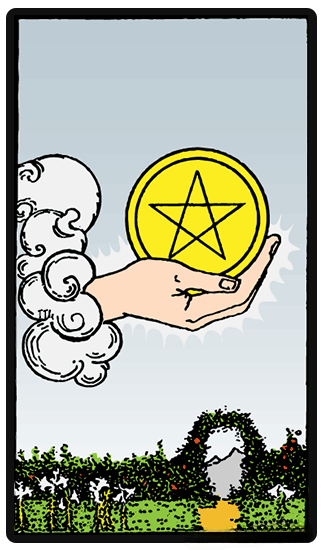 Though the Ace of Pentacles usually heralds an opportunity of some sort that would lead to great gains, to see it reversed can mean that this might be a poor investment, requiring much more resources than you had initially reserved - or alternatively, you might be missing your chance. When one gets a reversed Ace of Pentacles, it may mean that they are about to face hard financial times as well as a lot of elusive opportunities. At this time, you are being advised against taking large financial risks and to think all your choices through when you are given a deal. It might also be a good time for an individual to seek advice from others and avoid making rushed decisions since the time isn t just right. It wouldn t be a good time for one to jump into a new job or business opportunity - especially if the main motivation for joining is to pursue prospects of higher financial gain. It might just be an illusion that can lead to your downfall.